Portman, outside one of the many properties he designed and developed. 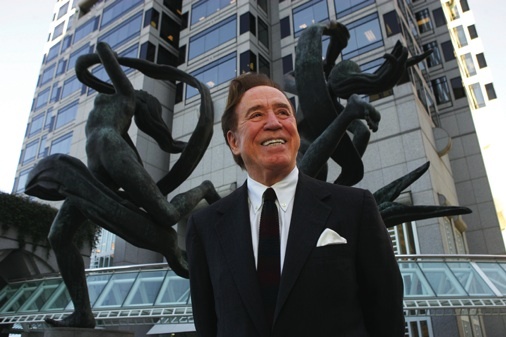 Always famous yet never in the limelight, John Portman, 86, is an architect who made his stamp on the world through hotel atriums and Atlanta’s Peachtree Center. While other careers were launched with flamboyant cultural icons, Portman took a more entrepreneurial approach, becoming one of the first of a new breed, the architect-developer. With offices in India, Korea, and China—and still living and working within five miles of wherehe was born in Atlanta, Georgia—Portman talks with AN about his own strategies for riding out good times and bad. The Architect’s Newspaper: You attended Georgia Institute of Technology in the 1950s. How prepared were you to become an architect? John Portman: I opened my own office in November 1953. Luckily, I had good experience working with Ketchum, Gina & Sharp and H.M. Heatley Associates, and they were, along with Victor Gruen, the leaders in retail design at the time. But I got tired of losing commissions to established firms because I didn’t have a track record. In order tomove faster, I formeda partnership with one of my ex-professors, H. Griffith Edwards, who taught office practice and specifications. We had a great partnership, Portman & Edwards, for 15 years until he retired. When did you decide to get into development, too? In 1956, I happened to make friends with the local dean of real estate, and I was fortunate enough that he let me go on some calls. I realized that if I found the site, came up with the idea, and figured out the financing, then there would be no question about who was going to be the architect. I don’t think anyone else was doing that at the time, so I guess you might say that I pioneered the architect-developer, and I have been doing that ever since. My first development was the Merchandise Mart in Atlanta, which I started in an old garage that we remodeled.It opened in 1961, and has grown into the AmericasMart with eight million square feet today. Yep, and that helps me get through the rough times. Has it always been smooth sailing, then? The 1960s were strong. We had nothing but great activity right up until ‘73, when the oil embargo caused a major slowdown into the ‘80s. During those times it was pretty rough, but we’ve always done architecture work for clients while we have our arm that brings together investors so we can develop for ourselves. Would you recommend the architect-developer model for young practitioners today? Development is a really risky game, and nothing good is ever accomplished without enthusiasm and an understanding that you might be wrong. But if you approach it correctly, the odds are in your favor as long as you protect against the downside as much as possible and don’t get so romantically carried away with the upside that you get killed. How do the two parts of your practice compare? The architectural side is always larger, because it takes more people to do the projects than it does to manage and develop. So it’s a different set of skills and a different kind of cycle. The largest we’ve been is 120 architects and about 49 developers. You were one of the first Western archiects working in China. How did that happen? When Deng Xiaoping came to Atlanta while Carter was president, we put him up on the top floor of our hotel [the Hyatt Regency Atlanta]. He then invited a delegation of eight people in 1979 to come to China, and I was in the group. So that opened the door for us, and we started an office there and built the first mixed-use project in mainland China, the Shanghai Center that opened in 1989. We’ve had a very good success run in China for some 20 years. In fact, most of our work now is outside the U.S., and we are very busy in India and Korea. Did you see the latest downturn coming? I had a pretty good hunch about a year before, based on the capital markets being the most extraordinary I had ever seen—and that couldn’t last. We started to look at it very seriously as something going to wind down, and we made some very conservative plans and avoided anything risky. What’s the major risk in being an architect-developer? Yes, Scarlett! Well, tomorrow is another day. The trick is to stay on the hills and get out of the valleys. I don’t try to proselytize; I don’t sell to others. I try to never get away from the fact that I am first an architect and everything else is to support that.